This topic contains 1 reply, has 2 voices, and was last updated by Doug Schneider 2 months, 2 weeks ago. 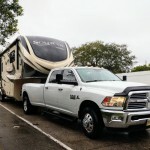 Just a few days ago we traded in our Eagle Cap 1165 Truck Camper for a 2019 Grand Design Solitude 310GK-R. It is 35′ or officially, 34’11” which is perfect for us as we wanted to stay at or under 35′. Even as full-timers, we were quite happy with the Eagle Cap, but Lin An had concerns that if I became incapacitated or no longer around, she would not feel comfortable driving or loading the truck camper. Coupled with the fact she was diagnosed with vertigo a few months ago and her tall stature and low ceiling height was playing havoc with her vertigo, so we traded in our home for the last year and so far very happy. I am calling it Lin An;s mansion on wheels.